The cul-de-sac was named after HFHR Executive Director Emeritus, Karin Roberts. In Moreno Valley, two adjoining lots on Myers St., owned by the Housing Authority of Moreno Valley, had sat vacant for over 20 years. The chain link fence was bent over and transients and others were using it at night. 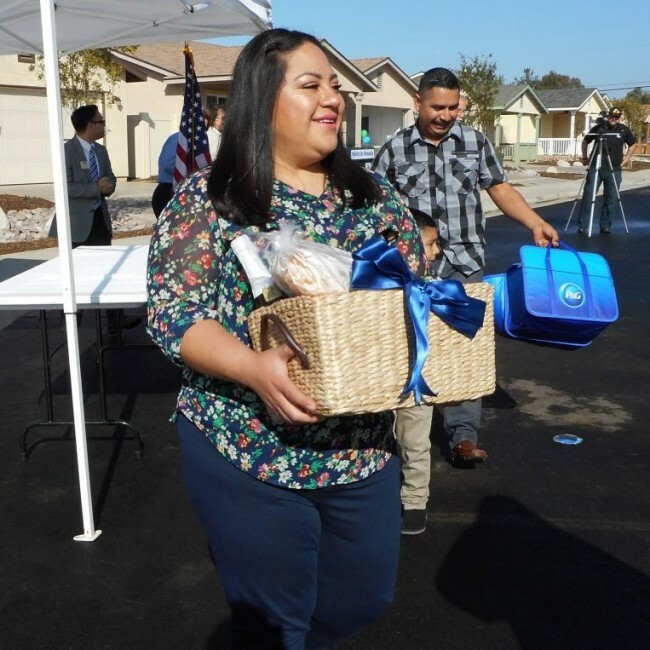 On January 30th, thanks to a partnership between Habitat for Humanity Riverside, the City of Moreno Valley, the U.S. Department of Housing and Urban Development, Bank of America, and GRID Alternatives, Habitat for Humanity Riverside held a dedication ceremony for eight brand new homes. Moments before the dedication ceremony started, our partner families gathered in front of their new homes alongside friends and family. Sheena, a single mom purchasing one of the four bedroom homes noted “I am holding back tears; I’m so excited that this day has finally come!” Seven families have been pre-approved to purchase homes and will take on a 0% interest mortgage, underwritten by Habitat for Humanity Riverside. These families have been working alongside volunteers to build their homes for over a year. At the start of the dedication, Habitat for Humanity Riverside Executive Director, Kathy Michalak invited up Karissa and Elizabeth, two children who will be living in one of the homes, to recite the Pledge of Allegiance. Introductions and a prayer were then given by members of Habitat for Humanity Riverside’s Board of Directors. California Assembly Member, Jose Medina reminisced about when he helped raise the walls just a year prior. 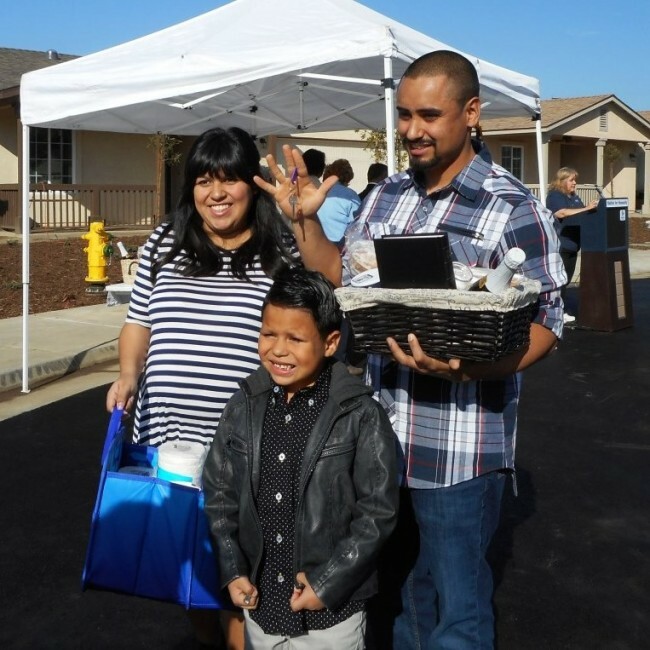 “ I see this [volunteering] as the best of our communities coming together to do something great.” Moreno Valley Mayor Dr. Yxstian Gutierrez commented, “I am grateful for organizations like Habitat for Humanity Riverside for creating opportunities for families while building stable and strong neighborhoods”. David Hahn was invited to the stage to speak on behalf of Bank of America. David is a longtime supporter of our organization and has devoted many hours volunteering towards building these, and other Habitat homes. 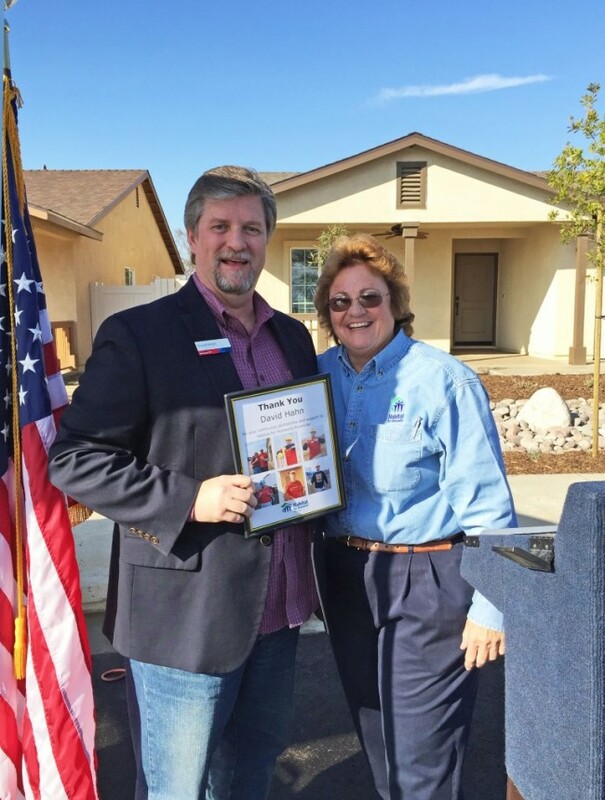 Before leaving the stage, Kathy Michalak presented him with a thank you poster featuring photos of the many times David has volunteered with Habitat for Humanity Riverside projects. 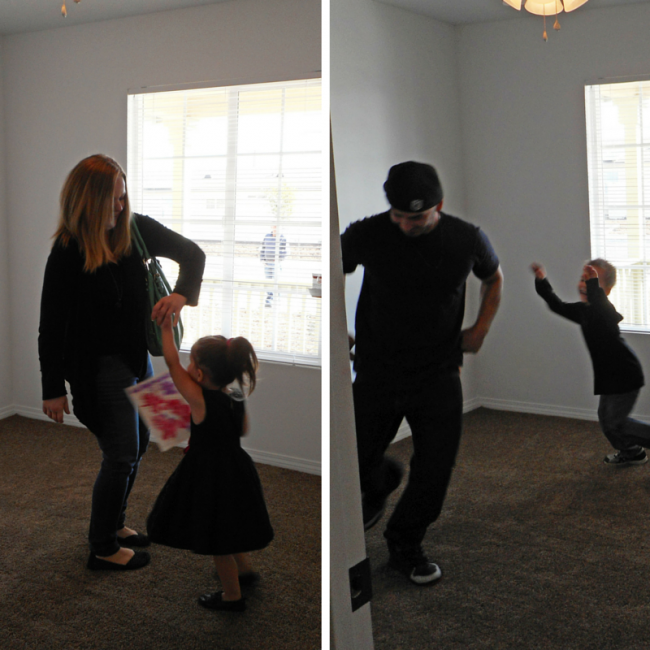 Roger and Rachel celebrated by dancing with their kids in their new rooms. This project involved bringing in a new water line from Heacock St. along Myers to the new development, as well as a brand new city street. 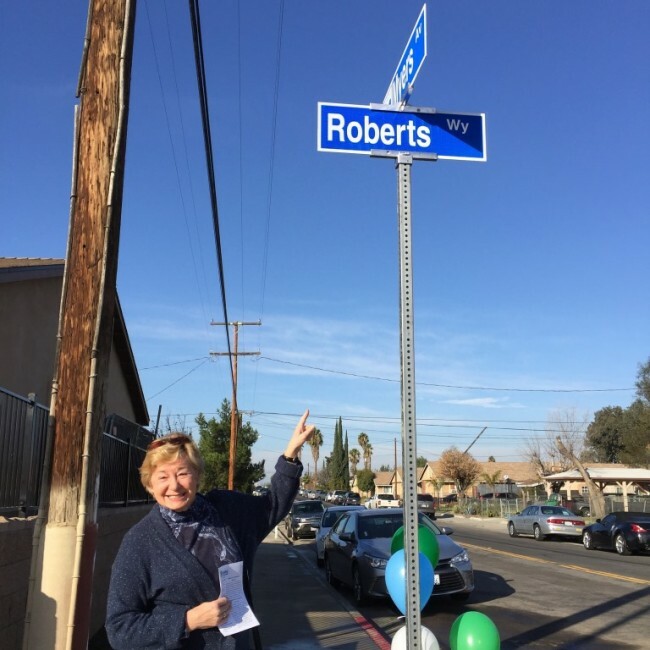 As the developer, we were allowed to name the new street (Roberts Way) in honor of our Executive Director Emeritus, Karin Roberts. The dedication was closed with a touching story from Nick Holst from Discovery Christian Church in Moreno Valley. Read about the PE’s article about the day here. 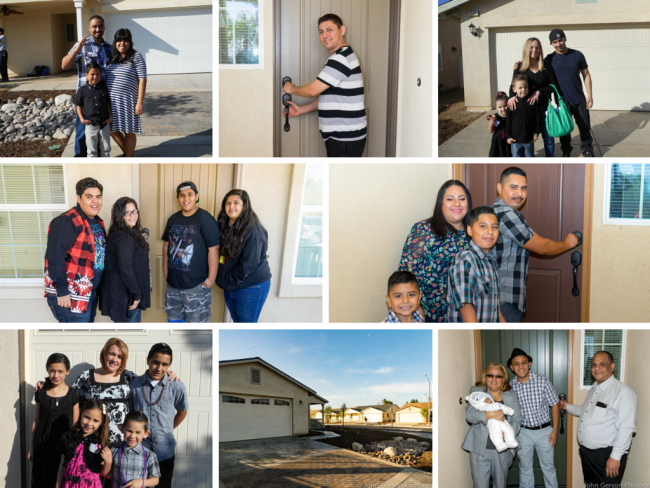 Congratulations Portelles Family, Najar Family, Cuevas Family, Cordero Family, De La Cruz/ Rocha Family, Hidey Family, and Kerolos/ Youssef Family on your new homes! I have an enormous amount of respect for this organization, you truely do make dreams come true. 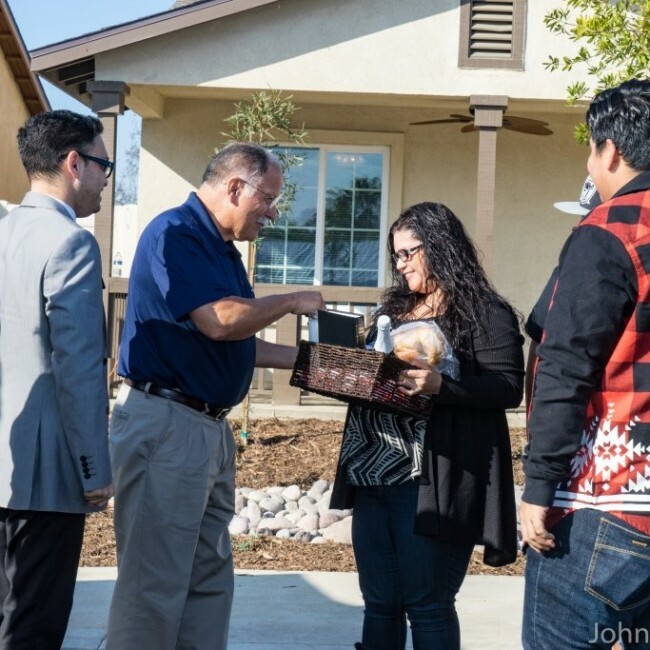 We also whole hearted believe that homeownership provides incentives for good neighborhoods and thriving communities, as well as provides financial stability for families, allowing them to save and invest in their futures. Thank you Pam for your continued support and encouragement, but we can not take all the credit! We are only able to accomplish what we do because of our dedicated and faithful donors, volunteers, and Riverside ReStore supporters. How do people get choosen what are tge requirements? How do people get choosen what are the requirements? Thank you for your interest and inquiry. A complete list of information about our home purchasing programs can be found here. Homebuyers must earn between 30-80% of area median income for Riverside County. Must demonstrate financial responsibility by having a steady income and acceptable credit. Must be willing to partner with Habitat for Humanity Riverside by completing sweat equity hours and attending home buyer education courses. Must be a citizen or permanent legal resident of the United States. Must save $500 as a down payment to cover closing costs.